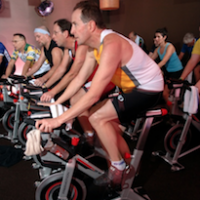 By now, I am hoping you recognize the physical and mental benefit of incorporating longer intervals into your repertoire of classes, whether you plan on doing FTP testing or not. The question remains, how do I keep my riders interested? Won’t they be bored? What if I get bored? The reason people get bored is because they don’t have anything to attach their minds to. This isn’t as necessary in a very short on up to about a 3-minute effort, but once you get beyond the length of the typical mainstream song, the mind starts to wander. Riders need guidance not only on how much resistance or what cadence at which they should be riding, but also what should it feel like? What should they be thinking of? Is there a way to take their mind of the hard sensation of effort? People can most definitely learn to not get bored if given the tools to stay engaged, focused, and committed. Below are nine tips that link to numerous drills and hundreds of motivational and inspirational cues to keep your riders engaged and happy—even while they are working hard for extended periods.